This article appeared in the Fall 2008 issue of Texoma Living!. 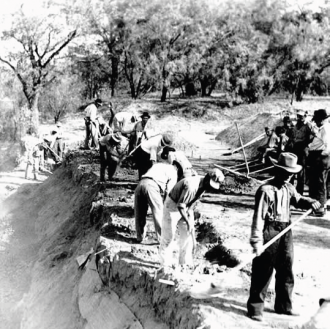 Texas has provided good hunting for scientists looking for traces of the past. The Alibates Flint Quarries along the Canadian River in Moore and Potter Counties in the Panhandle represent some of the most important bodies of evidence as to the industry of ancient peoples. For ten thousand years, men mined the rainbow-colored flint in the dolomite outcropping of the Permian Age. The flint, usually maroon and white, but also found in shades of blue, brown, yellow and red, provided stone tools for the Clovis cultures that occupied the Southern High Plains. Early Americans utilized the flint from the quarries until well into the 19th Century. The area is now a National Monument, so designated in 1965. The discovery of the ship La Belle in Matagorda Bay near the Padre Island National Seashore in 1995 proved an important link in the effort to learn more about René Robert Cavelier, Sieur de La Salle’s explorations and ill-fated attempt to start a French colony on the Texas coast in 1685. State marine archaeologist Barto Arnold spent seventeen years searching for the vessel, and its recovery prompted a book, The Wreck of the Belle, the Ruin of La Salle by acclaimed historian Robert S. Weddle of Fannin County. Weddle is the preeminent scholar on Spanish Colonial Texas and has been honored by the Spanish government for his work. Further down the Gulf Coast near Port Isabel in Kennedy and Willacy Counties is the Mansfield Cut Underwater Archeological District and the remains of three Spanish shipwrecks caused by a 1554 storm off the southern coast of Texas. The exact locations of the Santa Maria de Yciar, the Espiritu Santo and the San Estaban have not been published. The Keystone Wetlands Archeological Site is in a fifty-two-acre park in El Paso’s Upper Valley. During a Corps of Engineers flood-control dam project in the late 1970s, a rainstorm washed away the bank of an arroyo and uncovered an ancient pitch house. Carbon dating indicated the site was more than four thousand years old. Scientists found evidence of other huts, part of a village, which National Geographic Magazine suggests may be one the largest and oldest of its kind in the United States. Along the Clear Fork of the Brazos River in Young County in North Central Texas is the Harrell Site. Excavations in 1936- 37 confirmed the locations of pre-historic villages reaching back a thousand years or more. Today, modern archaeologists are reexamining the Harrell Site and employing current scientific techniques to discover its historical secrets. Located near the town of Vega in Oldham County, the Landergin Mesa consists of a series of buildings atop a steep-sided mesa on the east side of East Alamosa Creek. It is one of the largest, best stratified, least damaged, and most significantly located ruins of Panhandle culture. It is listed on the National Register of Historic Landmarks. Bob Allen has been in the radio business since he was a kid in Oklahoma City. He owns and operates Texoma’s KJIM-AM. With a notable career in radio and advertising from one coast to the other, Allen always wanted his own radio station.